What should my HDL be? According to the American Heart Association, men should aim for HDL levels of 40 mg/dL or greater, and women should aim higher than 50 mg/dL. Levels of 60 mg/dL or more for both genders have been linked to lower disease risks and protection against heart disease. Genetics can affect your HDL level, but lifestyle choices still also play a role. If you want to fight your genes and improve your HDL levels, the following foods can help. Walnuts, almonds, peanuts, pistachios, pecans, peanuts, and hazelnuts are all good sources of heart-healthy fats and are great to add to your diet to increase your intake. Add nuts to cereal, yogurt, salad, stir fries, pasta dishes or rice. You can eat them raw, baked or lightly toasted, too. Fatty fish like salmon, mackerel, albacore tuna, and halibut are highest in omega-3 fatty acids, a specific type of unsaturated fat shown to be most beneficial for heart health and reduce the risk of death by heart attack. It is recommended to eat at least 2 servings of fish per week. If you don't eat seafood, you could try fish oil supplements; flaxseed and walnuts contain omega 3’s as well, but fish contains the most usable form of omega-3s. Olive oil is high in unsaturated fats and can help you elevate your HDL. Replace butter and fried foods with foods cooked lightly in a heart-healthy olive oil, and switch to an oil-based vinaigrette for your salads. Oil is healthy, but it's high in fat and calories, so remember to practice moderation and keep your portions in check! 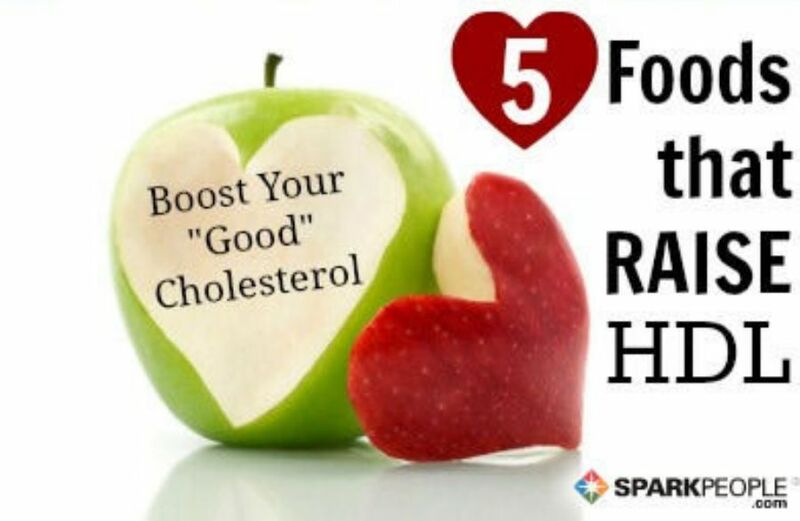 Although many dieters shy away from this fruit because of its high fat content, it's perfectly good for you thanks to its heart-healthy fats. Mash avocado to use as a spread on your sandwich or wrap, dice it into your salad, add it to omelets or whip up some homemade guacamole to enjoy with veggies or whole grain crackers. Fiber, especially soluble fiber, can help bump up your HDL while reducing LDL. Oatmeal is an excellent source of soluble fiber, as is rice, bran, barley, dried peas and beans, and certain fruits like prunes and apples. A couple servings a day of these heart-healthy foods can have a positive effect on your HDL. Along with these HDL-boosting foods, don’t forget the daily exercise! Regular exercise signals your body to produce more HDL, making physical activity one of the most important factors to raising your HDL. Start with just 5-10 minutes a few days a week, but gradually increase until you're active for at least 30 minutes 5 days per week. Your heart will thank you! So you got the results of your recent cholesterol test, and your HDL cholesterol came back low. Since low HDL is a risk factor for heart disease, you know that you need to elevate it...but how? When all the stories you read are talking about lowering your total cholesterol, why would you want to increase this form of cholesterol? HDL (high density lipoprotein) is the "good" cholesterol. It acts like a cholesterol dump truck, gathering "bad" cholesterol from the arteries and carrying it back to the liver for clearance. This heart protective effect may even slow the buildup of plaque in the arterial walls of the heart. HDL may also have some anti-inflammatory effects that are beneficial to your heart. That's why you want your HDL to be high, so it can better carry out these responsibilities and protect your ticker.